Nassau Personal Injury Blog 2011 October Times reports more reported hip replacement failures, but consumers will be left with little recourse. 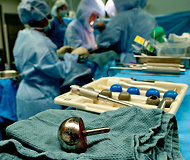 The New York Times reportss today the marked increase in metalic hip replacement failure. People who have had this surgery will learn of the federal preemption protection provided to this manafacturers which may bar lawsuits for the known product failure. The ball section of a removed artificial hip. Some patients with all-metal hips, ones in which the cup and ball of a joint are made of metal, said they had trouble finding a doctor to help them. Dr. Young-Min Kwon, the lead orthopedic surgeon on the operation, said the damage was more extensive than tests had indicated and might be permanent. "The prognosis is guarded," Dr. Kwon said. Similar scenes are playing out at hospitals nationwide as a growing number of patients seek to have faulty metal-on-metal artificial hips removed and replaced. More than a decade ago, some researchers had warned that the hips shed tiny pieces of metallic debris that posed potential health threats to patients. But those warnings were not heeded, and now doctors and patients face a growing public health problem as one of the country's biggest medical device failures unfolds. Some patients with all-metal hips - ones in which the cup and ball of a joint is made of metal - said they had been bounced from doctor to doctor who did not have the knowledge or the tools to properly diagnose the problem. And by the time they reach specialists like Dr. Kwon at Massachusetts General Hospital, potentially lasting damage may have already taken place. Dr. Kwon's recent patient, Robert Cartier, said he saw seven doctors over the course of a year who told him not to worry or who gave him shots for his pain. Diagnostic tests also did not point to a problem. Only recently have researchers determined that such scans need to be run in a specific way to detect the extent of metal-related damage. "It really didn't get picked up early. I picked it up," Mr. Cartier said, adding that he learned of Dr. Kwon while researching metal hip problems on the Internet. "It is like buyer-beware kind of stuff, you are trusting the doctors." All orthopedic implants, regardless of their composition, shed debris as they wear. But researchers say they believe that the particles released by some all-metal hips pose a special threat because scavenger cells dispatched by the body to neutralize the debris convert it into biologically active metallic ions. In some patients, a chain reaction begins that can destroy tissue and muscle. For researchers like Dr. Kwon, the challenge is to identify both those patients most at risk and the best ways to monitor them. So far, only a small fraction of the estimated 500,000 people in this country who received an all-metal hip over the last decade have suffered injuries. But studies suggest that those numbers will grow and that tissue destruction is occurring silently in some patients who have no obvious symptoms like pain. "What we are seeing is a complex phenomenon," Dr. Kwon said. A recent study in England found that all-metal hips were failing early at three times the rate of hips made from metal-and-plastic components, which can last 15 years or more. Most people recover well from a device replacement procedure, but specialists like Dr. Kwon are also seeing growing numbers of patients with complications. Over the last year, his caseload has tripled and other specialized hospitals like Rush University Medical Center in Chicago have also seen cases. In the first six months of this year, the Food and Drug Administration received more than 5,000 reports about problems with the all-metal hips, according to a recent analysis by The New York Times. In May 2010, Mr. Cartier, an electrical contractor who lives in Manchester, N.H., got an all-metal hip on his right side when he underwent a procedure known as "resurfacing," an alternative to traditional hip replacement intended to provide more mobility. A similar procedure performed in 2009 on his left hip appeared to have gone well, but the more recent operation left him in pain. Frustrated with advice from doctors, he took the trip to Boston to see Dr. Kwon. In 2007, the surgeon had arrived as a fellow at Oxford University in England just as problems with all-metal hips were emerging in England and Australia, two countries where the implants were used earlier than the United States. Since then, he has become a co-author of several studies linking metallic debris and aberrant tissue growth. For Dr. Kwon, Mr. Cartier's predicament posed a puzzle because he lacked some obvious signs of trouble; his implant, which was made by Stryker, had not been recalled, and the device had been implanted properly. But when the specialist ran his own diagnostic tests, there was evident tissue damage. "He was the trouble guy," Mr. Cartier said. "He deals with the cases that other people couldn't figure out." Other patients have encountered frustrations. For example, Cyndi Lafuente, a senior adviser at the Internal Revenue Service, learned last year that the model of artificial hip she got in 2007 was being recalled by its manufacturer, the DePuy division of Johnson & Johnson, because of its high early failure rate. Ms. Lafuente said she contacted her surgeon, who ordered a blood test and diagnostic scans, which came back with normal results. Still concerned, she contacted a British researcher, Dr. David Langton, who had helped sound the alarm about the recalled model. In January, she met again with her orthopedist, armed with information from that talk and other research. The physician suggested that they run an added test. It showed very high metal levels, she said. Now, four months after replacement surgery, her recovery has been slow and her leg is still weak, said Ms. Lafuente, who has sued DePuy. "If I had not played an aggressive role, I think I would have had permanent damage" to muscle or bone, she said. In May, the Food and Drug Administration ordered makers of all-metal hips to develop studies to determine how frequently the devices were failing and the implications for patients. But those studies are not likely to be completed for years, leaving specialists like Dr. Kwon to face a medical problem playing out in baffling ways. For example, while some patients like Mr. Cartier with high blood levels of metallic debris show evidence of tissue damage, other patients with high levels appear fine. Tissue damage is also occurring in some patients with low or normal metal blood levels and in some patients who are free of symptoms. As for Mr. Cartier, Dr. Kwon is not done with him. Even before the recent operation to replace his right hip, the surgeon told him the metal hip joint on his left side would also have to be replaced. "He told me, 'I can't guarantee that you are going to be one of those guys who come out as well as you went in,' " he said.